There are many different types of dolphin, but the most well-known are the common bottlenose dolphins. These dolphins are extremely inquisitive and playful, highly intelligent and sociable and highly surface active. They can often be seen doing amazing acrobatics, such as lobtailing, breaching, spyhopping and bowriding on ships and large whales, and playing with fish, seaweed or marine debris. They can often be found in small groups associating with other species of dolphins, whales, and even sharks and sea turtles. They are known to co-operate with local fishermen, driving fish towards shore into nets. Unfortunately, bottlenose dolphins still die through accidental capture in fishing nets, and face other terrible threats like drive hunting in Japan and other countries, pollution, and habitat degradation. In some countries they are still captured live and sold into captivity for public display. You can adopt Kesslet, Moonlight, Sundance, Mischief, Rainbow and Spirit. 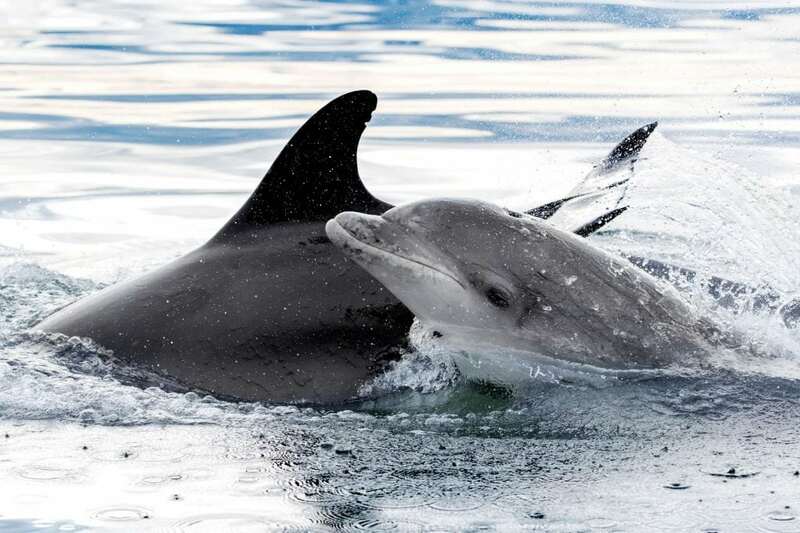 These six inquisitive bottlenose dolphins live around the coastline of the Moray Firth, Scotland. A tour of WDC’s Scottish Dolphin Centre for your employees, where you could spot the dolphins you are helping to support! Adoption plaque for display at your place of work, plus a digital certificate for your website to showcase your wonderful support. Information pack about the dolphins, plus a digital version that can be shared with your team, and customers. A special mounted photograph of your adoption dolphins to display at your place of work. A special ‘thank you’ video to your team, plus a personal update twice a year from, from WDC’s ‘adopt a dolphin’ field officer, Charlie Phillips. Fundraising support for events and acknowledgement of support on the WDC socials. Monthly email newsletters providing you with updates and images on your adopted whale or dolphin, and WDC’s work. A Skype Q&A or webchat with one of WDC’s experts on a whale/dolphin related topic of your choice. Complimentary copies of our award-winning magazine Whale & Dolphin every 3 months which features your adoption dolphins and how your support is making a difference to whales and dolphins around the world. A goody bag, containing WDC T-shirts, stickers, tote bags and other WDC merchandise to use as staff or customer rewards/incentives.